Aerway | Soil Service, Inc. These pictures were taken a few years ago, when we were having a dry spell in central Missouri. Not as dry as it has been this summer, but still dry. 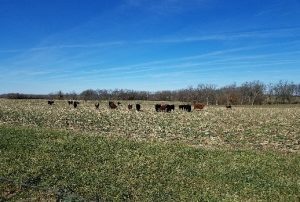 There is a lot of pasture in Missouri that is going to have some type of forage planted into it for fall and winter forage. Since we got some rain yesterday, 7/29/18, it makes a lot of sense to use an Aerway to incorporate the seed that is getting sown. The Aerway in the picture above was set at 0 degrees. If a 2.5 degree setting was used, and the double rolling basket harrow on it, the Aerway would do a great job getting seed to soil contact. We have done this with cover crop seed for the last few years on our farm and have good success. We have Aerways available for purchase and/or rental in sizes from 8 feet to 30 feet. 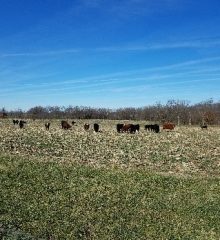 So, if you are thinking about what to do to your pasture to help ease some of your forage requirements this fall, give me a call to talk about your options. Here in central Missouri, we are dry, which has been a good thing for getting harvest completed and most (if not all) field work done. I really wanted to get a picture of the Soil Health Study sign with snow on it for this blog, but that was not happening here in the middle of December. 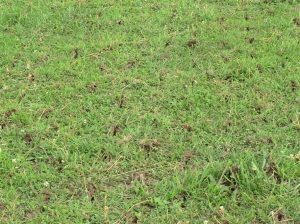 If you have been following this blog, you know that we have been using the Nutrient Recycling Program, along with crop rotation, Aerway as the only vertical tillage, no-till, and utilizing cover crops. 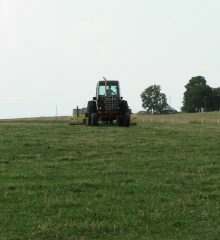 We are lucky to be able to pasture the cover crops, which is a great benefit, also. 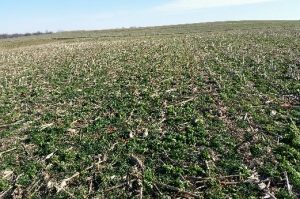 The pictures which I took last week show the growth of cereal rye and tillage radishes that were planted on October 30th, after the corn was harvested. The heifers have just been out there for a couple of days. I would like to take his approach one step further – USE THE NUTRIENT RECYCLING PROGRAM which we offer at Soil Service which also feeds the soil livestock, introduces more soil livestock, and helps them perform better. We are seeing some great changes to the soil in this field! The package of ingredients in the Nutrient Recycling Program really contributes to helping break down not only the residue on the surface, but also helping decompose the root systems of the plants. That’s where your organic matter comes from. Soil tests taken since 2012, show an increase of 1% O.M. 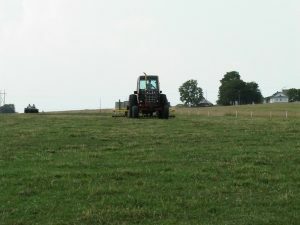 in this field (as of March 2017). I will take more soil tests this coming March to see where the O.M. is after the 200 + bushel corn crop on this field.